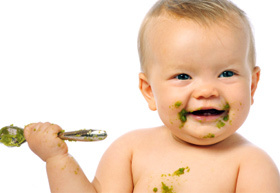 Your baby will be ready to eat few spoonfuls of solids by the time they become four to six months old. When starting with solids, there are no strict rules to follow and you can give both handmade food and jarred food or you can start with a combination of both types. It is better to prepare baby food at home. This will make sure that they are eating healthy and nutritious food and at the same time you will save on some money. Learn the equipment that you need and clear instructions on making food for your baby. How to Make Baby Food--What Equipment Is Needed? This is a gadget that first cooks the food by steaming and then purees it. You can use it to prepare puree of fruits, vegetables and meat. Some models also have the facility of defrosting and reheating the food that has been prepared previously. Search online for ‘baby food maker’. It is an inexpensive, non-electric and portable tool that helps in breaking down chunks of food. However, it does not provide a choice of textures. You should read the online reviews before ordering for them. Search online for ‘baby food grinder’. It comes with different types of blades to puree different textures of foods. This non-electric and portable gadget is a favorite of many parents. You can search online for ‘food mill’. It is a useful electric gadget that helps in pureeing the foods in a similar manner as a grinder does. Search online for ‘hand blender’. You can use your regular kitchen food processor to prepare the food for your baby, though it may be sometimes inconvenient to use for small jobs. A fork: You can also mash soft foods such as banana, boiled potato or avocado with a simple fork that is available in every kitchen. Ice cube trays or food containers are also required to freeze and refrigerate extra food. Ensure that you are giving only single ingredient meals to your baby until they are seven to eight months old. Give them foods after pureeing them in a blender or food processor. You can also mash the foods such as banana, avocado or soft cooked pasta with a fork and give your baby. 1. Wash and peel fruits and vegetables.Wash fruits and vegetables thoroughly and peel any tough skin that is present with a peeler. 2. Chop fruits and vegetables into 1” pieces before steaming them. 3. Use a steamer basket to steam the chopped food. Steam for 5-10 minutes or until the pieces become soft. 4. Use a food processor to puree the steamed foods and puree them until they become smooth. 5. Meat should be cooked to reach the correct internal temperature so as to kill bacteria present in it. You should use a meat thermometer to check the temperature. 6. In the end, use a strainer to strain the pureed food so as to remove any solid food particles. Avocados form ideal baby food that have a velvety texture and mild flavor and contains many brain-boosting omega-3 fatty acids. Buy avocados that are firm in texture and give only slightly when you squeeze them. Wash them and remove their seeds by slicing them in the middle, lengthwise. Use a spoon to scoop the flesh out from the avocado. 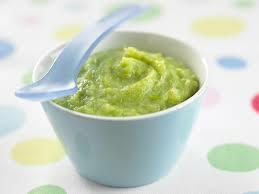 Puree the avocado slices into a food processor or blender. Form a puree of smooth consistency. You can add water to adjust the consistency or add breast milk or formula milk to increase the creaminess. Try not to freeze or refrigerate the leftovers or if you are doing so, use an airtight container to seal them. The temperature of the food should not be greater than the body temperature. If you have used microwave to heat the food, take care to stir the food so as to even out the temperature and check the temperature before serving. Don’t add extra sugar in your baby’s food. Never use corn syrup or honey in your baby’s food as it may lead to a type of food poisoning referred to as botulism that can even be fatal. You can use seasonings in your baby food instead of feeding them bland food. The leftovers should be refrigerated in airtight containers and should be used within a couple of days. Leftovers can also be stored in ice cube trays or other containers. After the food is frozen, remove them from the container and keep them in plastic bags in the freezer. You can use frozen fruits and vegetables leftovers for up to three months. Frozen meat and fish would last for a month or two. When using these frozen foods, defrost them by keeping them overnight either in the refrigerator or by keeping the container in warm water. Produce is most flavorful and nutritious when it is completely ripe. 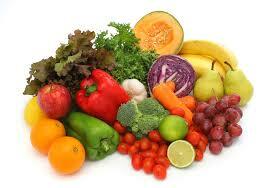 Choose produce that is completely ripe and is brightly colored and avoid foods that are bruised or too soft. You should explore farmer’s markets to get fresh produce that is fully ripe. Though you can also use canned fruits and vegetables; still it is better to use fresh produce. It is advisable to shop for fruits and vegetables from the organic section of your grocery store, as fresh produce is generally treated with pesticides and fertilizers that may be harmful for your baby. Some produce are more often treated with chemical pesticides than others. For instance, apples are treated with more chemicals. You should consult your child’s doctor before starting them on solid foods as some babies may start eating solid foods at 4 months while others may start later than that. The transition to solid foods should be gradual. You should introduce only a few foods at a time and any meal give them just one type of food. You can start with pureed fruits and vegetables and can gradually transition to pureed legumes, meats and cereals. Certain foods should not be introduced until your baby is one year old as they may lead to allergies or other illnesses. Some of these foods are: honey, dairy products prepared from unpasteurized milk, canned food prepared at home, expired canned food and food from cans that are dented.